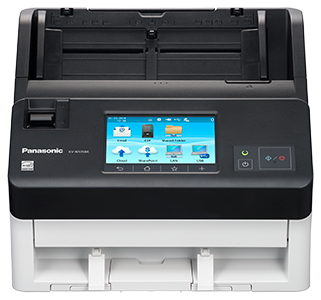 Panasonic has announced the launch of a new series of document scanners, ideal for small and medium-sized offices, alongside enterprise environments, banks, medical offices and hotels. The KV-N1058X series provides greater flexibility for businesses with multi-document scanning capability, meaning it can scan passports, embossed cards and long paper formats. The KV-N1058X also includes network capabilities, so it can connect to any business’ network via web browser and scan to email, FTP, SMB server, SharePoint or cloud, with the ability to directly transfer up to 5MB of scanned data to an email server at any one time by default. A wide range of scanning functions can be picked or modified on a large touch panel screen that displays all the options in colour. Alongside its impressive network features, the KV-N1058X delivers class-leading performance, scanning at 65ppm/130ipm* - the highest scanning speed of all Panasonic models in its class. It achieved the same speeds for both 200/300 dpi and binary/colour documents. The scanner comes equipped with a large-capacity automatic document double-feeder (ADF), ideal for scanning large document batches, double-sided documents and paper capacity of up to 100 originals (80/m2). 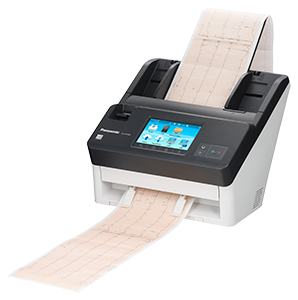 Additionally, the KV-N1058X works with the Panasonic Image Capture Mobile App that enables the sending of documents from the scanner straight to mobile devices.